French Water Partnership » Join #HLPF4Water – A collective campaign to put water at the heart of HLPF2018! Join #HLPF4Water – A collective campaign to put water at the heart of HLPF2018! The High Level Political Forum in charge of observing SDG progress will take place from 9 to 18th of July 2018. The focus is on water this year! #HLPF4Water is a collective campaign to make the international water community voice heard during this crucial event. Join us and spread the word with free water awareness material ! Water is one of the 17 priorities identified by the United Nations in its 2030 Sustainable Development Goals (SDGs) programme. This year, water will be one of the special focuses of the High Level Political Forum – HLPF ( 9-18th of July 2018), in charge of giving an annual update of SDG progress and share good practices for implementing SDGs. It’s a unique opportunity for the world to get together and remind the key state representatives present of what is at stake for water! #HLPF4Water is meant as a collective campaign, giving tools for the international water community’s voice to be heard throughout the HLPF event and beyond. It is composed of a #HLPF4Water “key figures” kit, available in English and French for free download. This includes 13 short videos (30 seconds) on a variety of subjects linked to water (sanitation, pollution, cities, energy, biodiversity, etc) calling for action during the HLPF. Banners are also available. The campaign starts today and will be carried out on Twitter until the 18th of July, end of the HLPF. What part can you play? The French Water Partnership, which represents all public and private French water stakeholders, thought of this campaign when they were at the 8th World Water Forum in March 2018 in Brasilia. All the international partners gathered there already awaited the HLPF of July, hoping it would bear positive results for water, given its focus on the matter. Even though the #HLPF4Water campaign is initiated by the French Water Partnership, the intent is for everyone to be able to use it freely within their own networks to convey their own messages on global water issues and contribute to the collective movement. It is solely directed towards water challenges in an effort to fuel action on the topic. Institutional logos are not present – giving all the spotlight to what really matters. 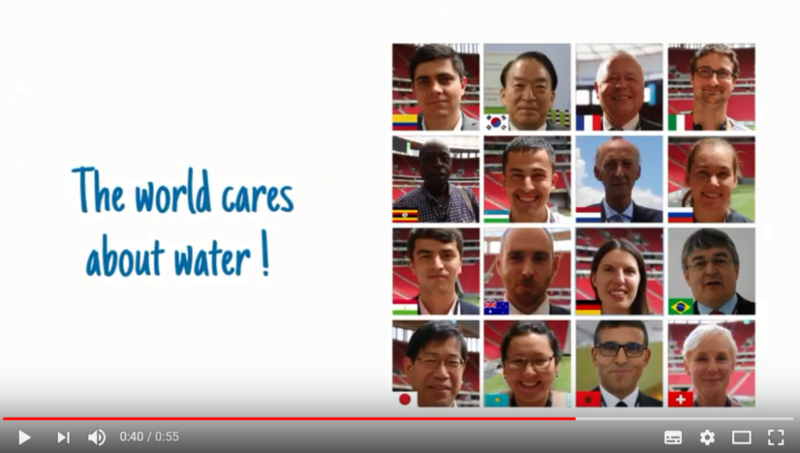 Check out the #HLPF4Water mobilization video made with testimonies of international partners in Brasilia : “Together let’s act for water”! An inspiring #HLPF4Water mobilization video made with the testimonies of international partners in Brasilia launches the campaign. Let’s make our collective voice be heard! Feel free to share! Add the #HLPF4Water banner to your email and communications! These organizations are also on the move to power up water visibility within the SDGs and the HLPF. Find out more about their actions here! [NEW] “Acting for water in the Sustainable Development Goals – French solutions “ – is a practical guide adressed to a general audience presenting active solutions by French water stakeholders designed to reach the targets linked to water within the SDGs. Imagining a +4°c world: what about water ?